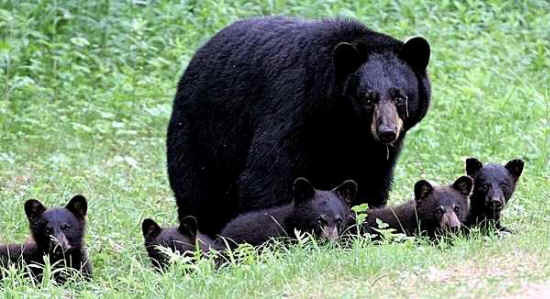 Black bears typically have two cubs; rarely, one or three. 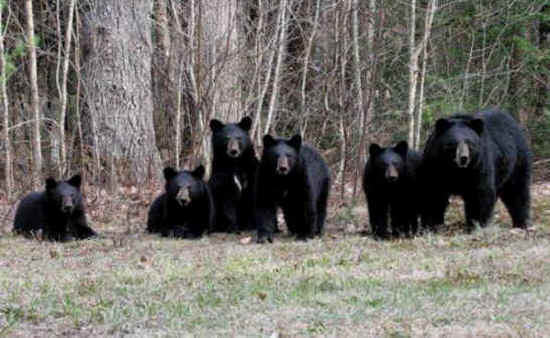 In 2007, in northern New Hampshire , a black bear Sow gave birth to five healthy young. There were two or three reports of sows with as many as four cubs, but five was, and is, extraordinary. I learned of them shortly after they emerged from their den and set myself a goal of photographing all five cubs with their mom - no matter how much time and effort was involved. I knew the trail they followed on a fairly regular basis, usually shortly before dark. After spending nearly four hours a day, seven days a week, for six weeks, I had that once-in-a-lifetime opportunity and photographed them. I used the equivalent of a very fast film speed on my digital camera. The print is properly focused and well exposed, with all six bears posing as if they were in a studio for a family portrait. On April 25, 2008 I achieved my dream.